Back in the day, men took great pride in their appearance. Beau Brummell claimed he took five hours to dress, and recommended that boots be polished with champagne. The original ‘dandy’ Beau Brummell was the arbiter of men’s fashion in Regency England and a friend of the Prince Regent, the future King George IV. He established the mode of men wearing understated, but fitted, tailored clothes including dark suits and full-length trousers, adorned with an elaborately knotted cravat. Beau Brummell is credited with introducing and establishing as fashion the modern man’s suit, worn with a tie. His style of dress is often referred to as dandyism. Today, men’s fashion is making a critical come back from head to toe. With notable figures such as, Daniel Craig and Clive Owen, men once again retain inspirational fashion icons to look up to. 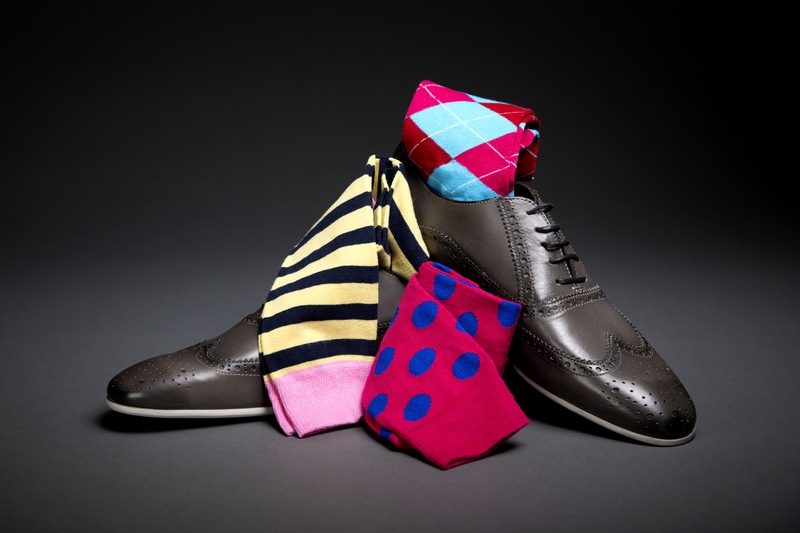 Gents are even pulling up their pant legs and kicking off their shoes to show off their smashing, stylish socks. London based company, Gallant & Beau, is one brand to keep an eye on because they are bringing dapper back to gentleman everywhere by way of…socks! With offices based out of Los Angeles and London, Gallant & Beau is spreading like wild fire. Gallant & Beau’s collection began in 2012 and is based off of the concept of the dandy man. The British term for a man who is dandy is also known as a gallant or beau, which is a man who places particular importance upon physical appearance, refined language and leisurely hobbies. The dandy man is pursued with the facade of nonchalance and a cult of self. In the 21st century, the word dandy is now a jocular, often sarcastic adjective meaning “fine” or “great.” When used in the form of a noun, it refers to a well-groomed and well-dressed man, but often to one who is also self-absorbed. Gallant & Beau has been keeping the ‘dandy’ alive and well for the past year. With sales exploding at Gilt Groupe (www.gilt.com) it seems that exquisite socks are making fashion statements left and right. The brilliant and appealing packaging is reason alone to buy a set of socks ($18.50 a pair). The box set also behooves anyone seeking a gift for the man in his or her life (3 pairs for $48.50). The Union Jack is stretched across the inner lid of the sturdy, attractive box. The theme for the spring 2013 collection involves playful patterns, such as polka dot and argyle, combined with deep tones to create a streamlined assortment. Socks from the collection are named after well-known London streets, such as Picadilly and Camden Town. In the works for Gallant & Beau are pocket squares and cuff links- the perfect accessories to add to any gallant’s wardrobe. To purchase Gallant & Beau socks, go to www.gallantbeau.com and check out daily updates at www.facebook.com/gallantbeau.